Home to soaring peaks, cascading waterfalls, and geothermal mud pools, Iceland boasts some of the world’s most impressive natural features—but the popular coach tours can only take you so far into the open countryside. On this tour, spin through the rugged wilderness by powerful quad bike with your guide. 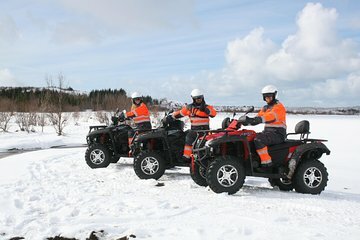 Hit natural attractions including Hafravatn Lake and Mt. Hafrafell, with round-trip travel from your Reykjavik hotel included. Amazing experience in the snow! Good duration of tour and friendly guide! Many thanks to the tour guide who made this experience super!